Operation Clambake was a detailed, well-planned raid for the Ungok hill mass in Korea but the cold February day of 1953 turned grim very quickly when the 1st and 2nd Marine platoons of Able Company began their assault. 2nd Lieutenant Raymond “Jerry” Murphy was the 3rd platoon leader and his assignment was evacuation. As the raid progressed, Lieutenant Murphy became uneasy and his instincts led him to believe his fellow Marines might be in trouble. Defying orders, Murphy led a small group of men up the hill to assess the situation. Unfortunately his suspicions were true. The assault had stalled and most of the senior officers and NCOs had been wounded or killed. Realizing the raid had failed, Murphy organized and led a heroic rescue effort. Under intense enemy fire Murphy made countless runs up the hill on a mission to save lives. As the other men pulled back Murphy provided cover and while maneuvering across the hillside he stalked the enemy to prevent further casualties. 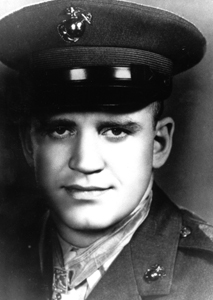 Only after he was sure that all the Marines were accounted for – Murphy left the battlefield. Jerry Murphy sustained numerous wounds but refused treatment until everyone else had been treated. When presenting Murphy the Congressional Medal of Honor President Eisenhower said “What is it in the water out there in Pueblo,(Colorado) all you guys turn out to be heroes.” Murphy’s life long mission has been to protect and aid those in need, today he serves fellow veterans by volunteering at the VA hospital in Albuquerque, New Mexico. Jerry Murphy passed on April 6, 2007. Click below to view a piece of the Jerry Murphy segment. Wordpress development and support by Stralim Technologies.